A vibrant field of blue pansies bloom in the sun. These velvety flowers, which are bright violet in color, have a blue center and a yellow piston. The beautiful flowers contrast with the dark green leaves. These spring flowers show nature at its creative best. Pansies can be perennials or rock garden plants, as well as annuals and biennials. Pansies can come in one solid color, or can be bi-colored. The two-toned varieties have markings that make the flowers appear to be wearing masks. Pansies are used in a variety of applications, and are equally at home in window boxes as they are in garden beds. Pansies are a hardy flower, and do well in all kinds of soil as well as in both light and shade. There are two types of pansies. Winter pansies flower from later autumn onward. They should be sown in summer, and reach their peak in spring. 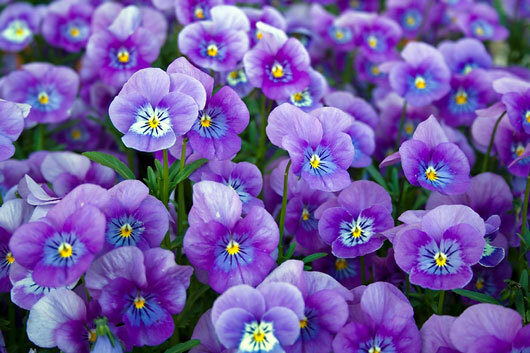 Winter pansy varieties include plants that belong to the Floral Dance Series and Universal Mixed. Plants in the Floral Dance Series produce single and bi-colored flowers in a range of colors, while Universal Mixed pansies produce single and bi-colored flowers in red, purple, yellow, apricot, and white. Summer pansies fare best when treated as biennials and sown in containers in the summer. The Jolly Joker variety comes in bright purple and orange, while the Lilac Frost variety features light purple flowers with a deep purple center. Majestic Giants Mixed plants come in a range of colors, while Padparadja pansies come in orange. Velour Purple Wings are smaller flowers that feature purple and cream petals with mauve in the center, and yellow along the edges.